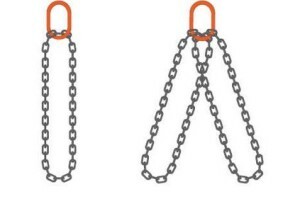 Since we’ve expanded our line of chain lifting slings earlier this year, it’s been great seeing the different types and sizes of chain slings customers are requesting. This one has been one of the biggest we’ve seen lately. 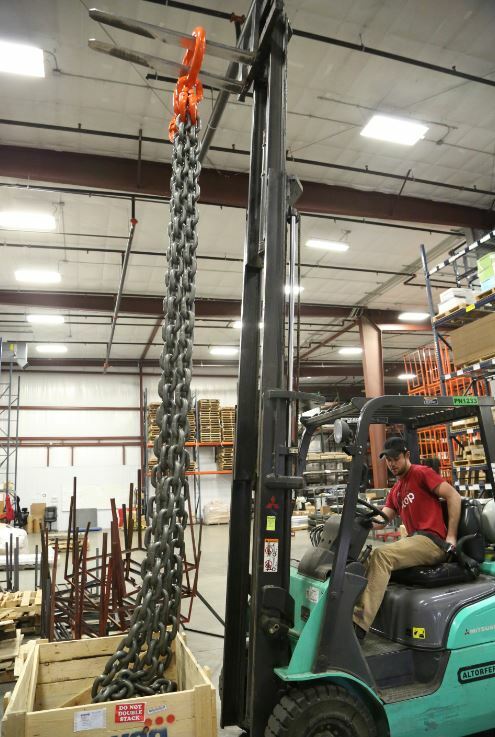 These chains have a capacity of 234,000 lbs. at 60 degrees, which means it would break at about 1,000,000 lbs. It’s being used to lift a large pump that weighs 210,000 lbs. 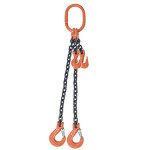 All of our lifting chain slings are manufactured with chain that’s made in the USA and European-made fittings. All also meet or exceed the latest guidelines of the National Association of Chain Manufacturers (NACM), ANSI B30.9 standards, and specifications set by OSHA. We offer four sling types: standard, adjustable, endless and basket. Standard chain slings. Manufactured with one, two, three, or four lengths of chain, and fitted with hardware at each end, with a master oblong link at the top. Adjustable chain slings. 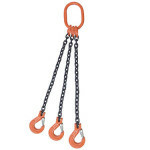 Similar to standard chain slings, but each leg is also equipped with a shorter length of chain with a grab hook also attached to the master oblong link. 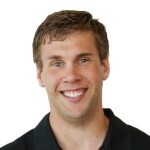 This design allows the operator to shorten the chain leg length as needed. Endless chain slings. As it sounds, an endless sling is an endless loop of chain attached through a master oblong link at the top. An additional variation has two loops of chain attached through the same master oblong. Our endless chain lift slings are available to order via our Custom Chain Sling Order Form or by giving us a call at 800-660-3585. Basket chain slings. In a similar design as the endless basket sling except it’s just one length of chain making up the body of the sling, with each end of the chain attached to the oblong master link. A double basket configuration has two lengths attached each to its own oblong link, with the oblongs then attached to a master oblong link. Basket chain slings can be ordered via out Custom Chain Sling Order Form or by phone at 800-660-3585. 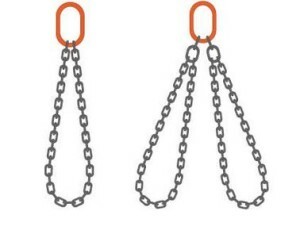 In addition to the four different types of sling, other options to customize the lift slings include the size of the chain, the grade of the chain, and the number of legs. Several end fittings are available including sling hooks, grab hooks, foundry hooks, self-locking hooks, and simple oblong links. 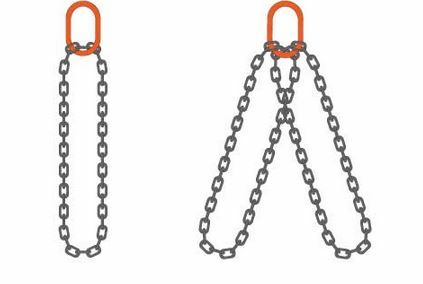 You can shop our online selection of chain slings here: Chain Slings & Lifting Chains, or give us a call at 800-660-3585 about any customization options you need. We’ll be happy to help find the exact sling you need.